It’s so easy to complicate this soup with the addition of carrots, corn cobs and some other greens like broccoli. But I prefer the simpler, Pinoy version, with just the basic ingredients of beef shanks, potatoes, cabbage and/or green beans. 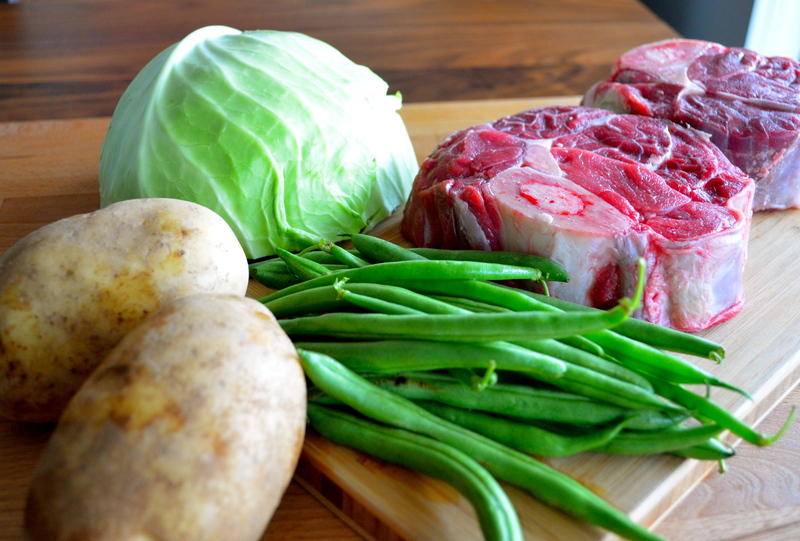 Keeping it simple and Pinoy: Beef Shanks, Potatoes, Cabbage, Green Beans. Don't forget the Patis! That’s how my grandfather, a butcher, preferred his nilagang baka too. In his family, beef – an expensive meat, even to someone who worked in an abattoir – was served only on Sundays. But what he brought home was always good, fresh beef, of such quality that it could be served in nothing more than a clear, well-seasoned broth, with nothing else that would overwhelm the pure beef taste, perhaps just some potatoes and cabbage, to make a more substantial fare for his family of 10 kids. I made this soup for the first time for my friend G. He had told me it was his favorite, and I also knew of his dread of the colder months and the inevitable winter. The temp had started to drop, and I couldn’t think of a more comforting dish to serve than nilagang baka : beef simmered to fall-off-the-bone tenderness, its broth ladled generously onto a bowl of rice, a hot and steamy dish usually served – and so curiously perfect – on a summer day. In Toronto, with potatoes and cabbage available even during the coldest, bleakest of months, this could well be the soup for our winters. Winter – I’d like to think – is nothing but a longing for home. Wash meat thoroughly. Place in a stock pot and add enough water to cover. Add onions, peppercorns and bay leaves. Simmer until tender, skimming the scum off the top. Drain broth. If you have time, chill in refrigerator overnight to remove excess fat that solidifies on the surface. Add potatoes to broth and continue to simmer until potatoes are cooked but firm. Add cabbage and green beans, then turn heat off and cover. Steam the vegetables for 5 minutes or until tender, yet still green and crisp. Season with patis/salt and pepper. Serve hot with steamed white rice. Serves 4. Not many know of the days when pan de sal was peddled on a bicycle, from a wooden box tied on its rack, in a thin, ocher-brown paper bag that would get as warm as the freshly baked buns it held. I remember our “magtitinapay” would signal his arrival with three short, tinny rings of his bicycle bell, a sound I swear brought – at least to my mom – both a sense of relief and an almost palpable swell of anxiety. She would pour the coffee before she rushed to the door – but what if Mang Turing reached into his box, found many “supot” marked with all the other housewives’ names and none marked with “Aling Nena”? This was way before little home bakeries sprouted like, well, pan de sals selling pan de sal. And way before a nation woke up to a shrunken version and an economy that had begun to head south. Most probably don’t even remember that pan de sal, paired with coffee, was our people’s breakfast of choice – not Payless or Lucky Mi Instant Mami. The pan de sal is that one taste of my childhood I hardly remember, but one that I will instantly recognize. Give me one that is soft, stretchy and chewy inside, with a crust that always and inevitably leaves a trail of tiny crumbs on the floor. It’s the one with the smell of yeast as strong/subtle as, I was told, the sweat of the baker who kneaded its dough. 3 tablespoons white sugar, divided into 1 and 2. Dissolve 1 tbsp of sugar in the warm milk. Add the yeast and let stand until frothy, about 10 minutes. In a large mixing bowl, combine the remaining sugar and the oil and mix until smooth. Add the salt, 1 cup of flour and the yeast mixture; stir well. Add the remaining flour, 1/2 cup at a time and mix until the dough is smooth and pulls away from the sides of the bowl. Turn the dough onto a lightly floured surface and knead for about 10 minutes. Lightly oil another large mixing bowl, place the dough in it and turn to coat the dough with oil. Cover with a damp towel or plastic wrap and let sit in a warm place until the dough has doubled in volume, about 1 hour. Turn the dough onto a lightly floured surface and press gently to remove air in the dough. Knead for about 2 minutes and let rest, about 10 minutes. Divide dough into 2 and form each piece into a cylinder about 1 inch in diameter. Using a sharp knife, cut each cylinder diagonally into 2-inch long pieces, about 10-12 pieces. Roll each piece on a plate of bread crumbs. Place the pieces onto a lightly greased baking sheet. Gently press each roll down to flatten. Bake at a pre-heated 375 degrees F oven (190 degrees C) until golden brown, about 20 minutes. Most recipes use water instead of milk. I thought milk (I had almond milk in the ref) would make my pan de sal a little healthier. I also found some recipes that had eggs as an ingredient, but I don’t remember tasting an “eggy” pan de sal when I was young. Maybe there was neither milk nor eggs in the pan de sals of those days. 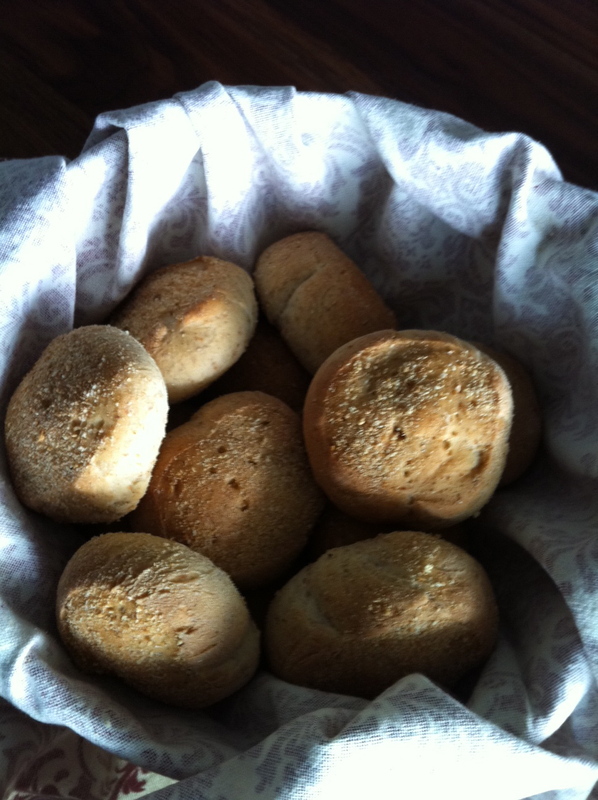 After all, wasn’t the pan de sal supposed to be our basic, simple, inexpensive daily bread?